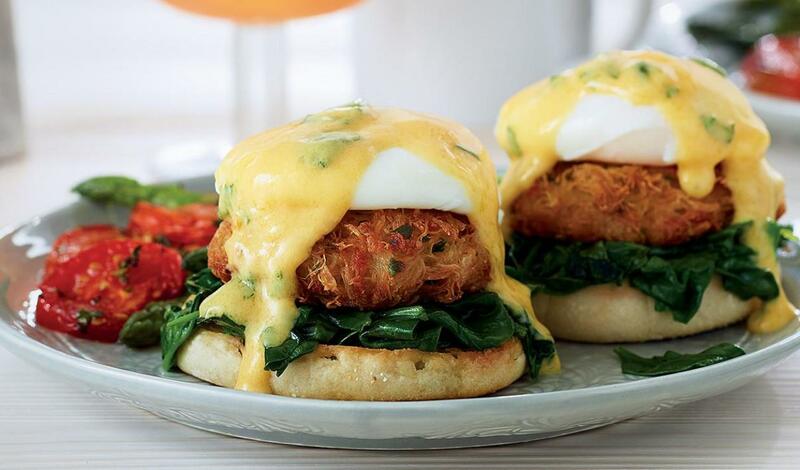 Offer something a little outside the box with this Crab Cake Benedict served with a sauce of wilted baby spinach and melted Boursin cheese, then paired with grilled tomato and asparagus. Perfect for Valentine’s Day brunch. Whisk together the mayonnaise and egg until fully combined. In a separate bowl, combine the next 9 ingredients and fold together until evenly mixed. Fold the crab mixture into the mayonnaise mixture until fully combined. Refrigerate the crab cake mixture for at least 1 hour. Form the crab mixture into 20 thick patties. Dust each patty with flour. Add enough oil to a large sauté pan to thickly coat the bottom with about ¼ inch of oil and heat over medium-high heat. Fry the patties for about 3 minutes per side, or until golden brown and heated through. Bring the prepared Knorr® Hollandaise Sauce Mix to a simmer in a pan over medium heat. Add the cheese and spinach, and stir until the cheese has melted and the spinach has wilted. Top half of toasted English muffin with sautéed spinach, one cooked crab cake, followed by poached egg and hollandaise sauce. Garnish with chopped chives and serve.